Claremont01263 821889work Bed & BreakfastOur small bed and breakfast offers a relaxing environment in modern, well equipped rooms. Guests can choose from a varied award winning breakfast menu, sourced locally. Rooms have a beverage tray, colour flat screen TV's and Wi-Fi. Cyclists and walkers are welcome. Our small bed and breakfast offers a relaxing environment in modern, well equipped rooms. 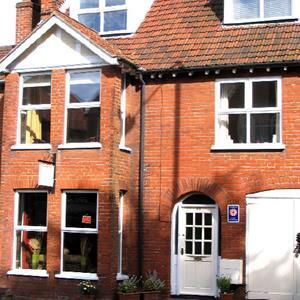 Claremont Bed and Breakfast is ideally situated from the town, to enjoy the shops, Little Theatre, cafes and restaurants, as well as public transport, the popular north Norfolk Railway, also the beach and footpaths for a walk in the beautiful north Norfolk countryside or the National trusts Sheringham Park. From the A148 take the A1082 signed to Sheringham for about 1 mile down the hill, towards the town centre and roundabout. Claremont House is on the right, before the Morley Road turning. Turn left from the train station or right from bus stand, straight over roundabout, cross at pedestrian lights. Claremont is 300 yards on the left, just after Morley Road turning.